It’s also a time where I like to get out of my comfort zone and make something new. This year it’s soaps. Have you ever made homemade soap? When I was growing up, a quiet, gray-haired woman in our neighborhood was an amateur soap maker. Her house smelled of cinnamon, clove, lemon, and lavender. Bottles, jars, and pots of unfamiliar substances lined her kitchen counter along with rows of soaps in trays and molds cooling and hardening. If you want to attempt something new—trying, experimenting, and bravery is all that’s required. 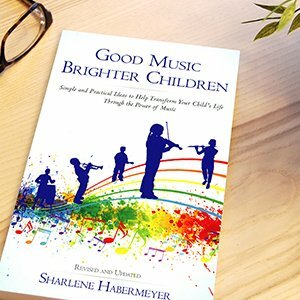 Trying something new is important for kids. It builds their confidence, creativity, and feelings of success. When faced with a difficult task, they will approach it with the attitude of “I can do this,” because they have mastered other hard tasks. Plus accomplishing something that not everyone is doing will give your kids additional feelings of success. Today, soapmaking is straightforward and easy. Ingredients are minimal, and the results are amazing! Even a three-year-old (with a little help from mom or grandma) can turn out a lovely, sweet-smelling bar of soap. Soapmaking no longer requires using unfamiliar ingredients or cooking over a hot stove with lye sitting on the counter. Thanks to melt-and-pour soap base, it’s as easy as 1-2-3. Use this as an opportunity to teach your kids about soapmaking basics, solving easy math equations, and learning the do’s and don’ts about cleansers and the skin. Daughters, sons, granddaughters, and grandsons can all join in the fun. Tell them you are going to make black soap that will do amazing things for teen acne. That should spark their interest! 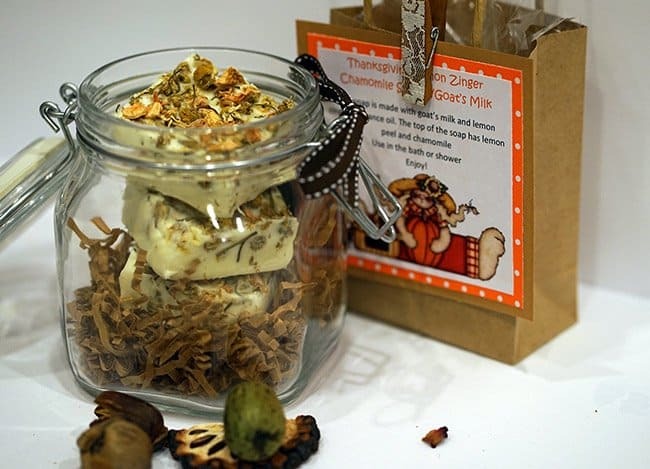 Here are 3 homemade soap recipes I created for Halloween, Thanksgiving, and Christmas. 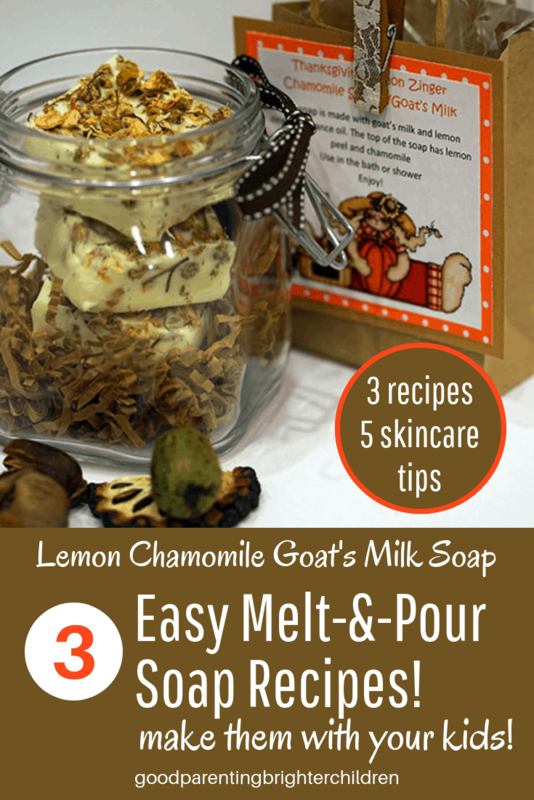 All three recipes use melt-and-pour soap base, which produces a glycerin or see-through soap. If you want a white opaque soap, you can add titanium dioxide to make it solid white (or purchase a white base soap). Add some dried peels, flowers, and buds to the top of the soap so that it has a dual purpose: cleaning and scrubbing the skin. This is a fun soap to make with your kids for Halloween. 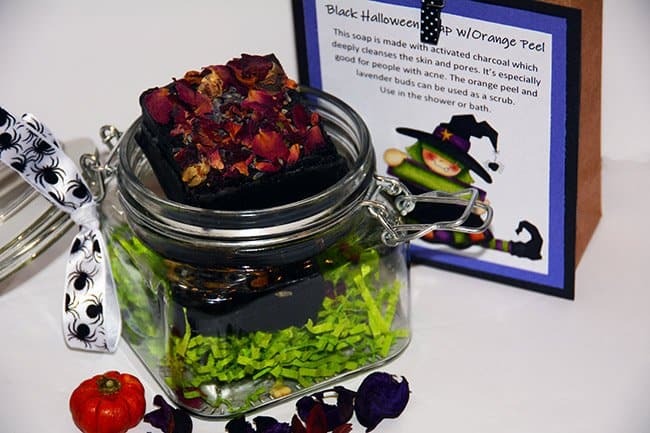 The contrast with the black soap and the purple lavender buds (purple is now the new black for Halloween) and orange peel make this a spooky gift for the season. To change things up a bit, I also use dried rose buds mixed with lavender buds. The secret ingredient in this Halloween soap: activated charcoal! This is a fun soap to make and uses activated charcoal which is amazing for the skin and is amazing if you have a teen with acne. The black color is intense–and it’s fun to add lavender buds, or dried orange peel or rose buds. Add the activated charcoal. It will turn an intense shade of black. Sprinkle the lavender buds and dried orange peel on top of the soap while it is still liquid. Press gently. As it cools, the buds and peel will stick to the soap. You can substitute the oils and the peels. Many essential oils have healing properties for the skin and will help the skin in different ways. Substitute lemon or grapefruit peels for orange peel. This is a beautiful soap to have on Thanksgiving Day for your guests. This is a really beautiful soap that can be used as a gift for Thanksgiving. I use the melt-and-pour base and then add titanium dioxide and goat’s milk to make the soap opaque. 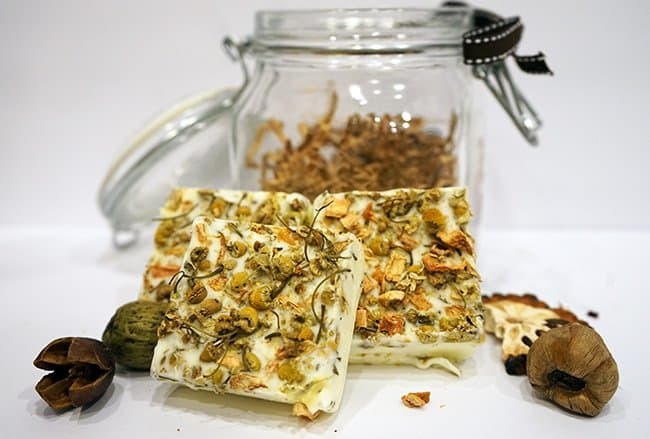 What makes this soap special is using lemon essential oil and putting dried chamomile flowers and dried lemon peel on the top. Combine the goat’s milk (or water) with the titanium dioxide and let sit for 1 hour. If you’re using a white soap base, you can skip this step. You use titanium dioxide to turn the glycerin melt-and-pour soap base into an opaque white soap–not clear. If you want the soap to have a pale-yellow color put a cosmetic-grade yellow dye in the mixture. This is a beautiful soap to give as a gift at Christmas. 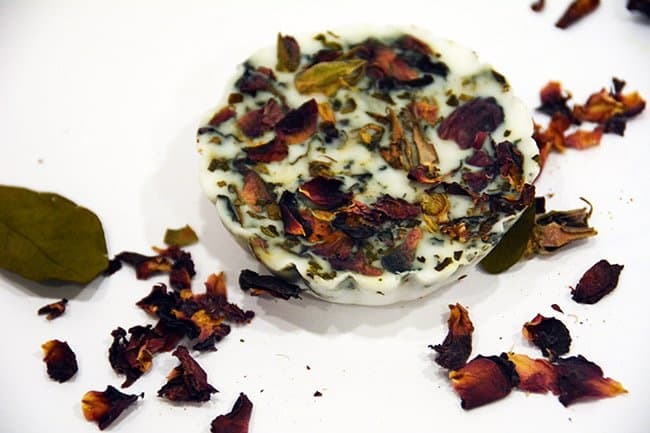 Putting dried rosebuds and peppermint leaves on the top create a beautiful soap and it smells divine! Try using tart pans as a mold for the soap. Everything about this Christmas soap spells “elegant!” I use both peppermint and rose essential oils with rose petals and peppermint leaves on top. It smells wonderful and works both as a soap and scrub in the bath or shower. Combine the goat’s milk (or water) with the titanium dioxide. Let sit for 1 hour. Again, the soap base is clear and you want it a white opaque soap. If you are using a white soap base, you can skip this step. Sprinkle dried rosebud and peppermint leaf on the soap while it is still a liquid. You cannot add them after the soap has set—they will not stick to the soap. *Note: Rose oil is amazing. It helps with insomnia, depression, headaches, and allergies. You can use other essential oils or fragrance oils to the mixture like spearmint, orange, lemon, Polynesian Red fragrance (pomegranate & cranberry), etc. Experiment! Having taught physiology (mainly of the skin) in college for 10 years, I want to share a couple of things you need to understand about soaps and cleansers. Many people do not understand that using the wrong cleanser will wear out your skin quicker than anything else. You need to use gentle cleansers—particularly on the face and neck. Amphoteric cleansers are mild skin cleansers. They will not strip the skin leaving it dry and lifeless. Try Dr. Bronner’s Pure Castile Soap. I recommend this for both oily and dry skin. It’s an oil based soap (hemp, olive & coconut oils) but remember: “opposites attract,” but “likes break down likes.” Meaning—if you have oily skin, and you use an oil based product—it will break down the oil and leave your skin feeling soft, not stripped. Also, the oil in Dr. Bronner’s soaps is not pore-clogging mineral oil. It’s a combination of healthy, good oils that feed the skin. 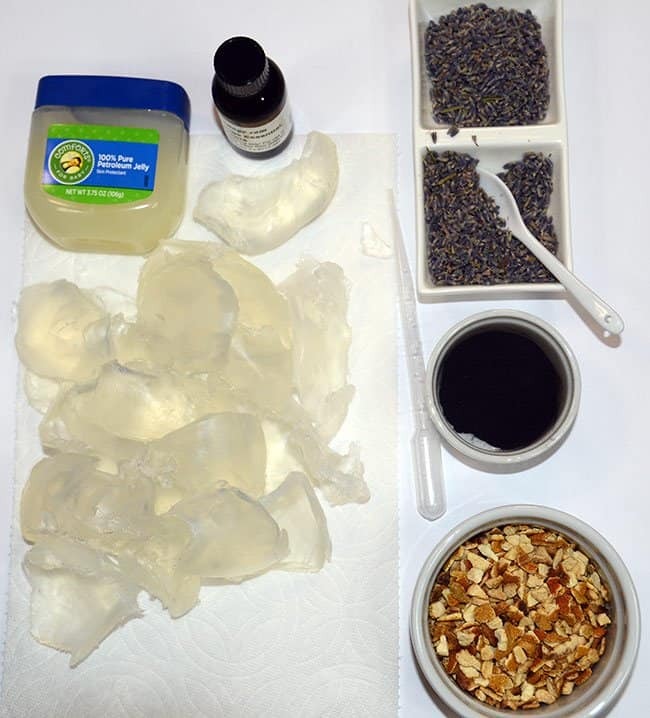 Sodium Laurel Sulfate (SLS) is an additive (emulsifier) that companies add to soaps to make them foam. They are drying to the skin, but that’s the least of your worries with SLS. It’s been linked to cancer, irritates the skin, causes endocrine disruption, and neuro and organ toxicity. Most studies on SLS are in the pure form—and you would never use the pure form. However, even at 1% concentration, you must consider the long-term cumulative effects. The good news? All these soap recipes are SLS-free and super safe for your skin. Do you use your same favorite skincare products year after year? It’s not a good idea. It’s like eating McDonald’s every day year after year. I know—you have that favorite moisturizer that you can’t do without. I get it! However, in order for your skin to stay beautiful and healthy looking, you need to change your skincare routine. You do this by “surprising” your skin. Meaning, rotate your skincare routine and use different cleansers. Choose 3 or 4 and alternate them. Your skin will not be the only one surprised at the results…you will too! Have you ever used a body brush to brush your skin before showering or bathing? It’s also called dry brushing because you are brushing your dry skin. There are many reasons it’s important to do this. Consider this: in one day, your skin eliminates more than a pound of water which rids the body of impurities. Dry brushing improves skin function which in turn improves elimination of these impurities from the body. Brush your hands first; arms, underarms, neck, chest, and back. Then brush the feet then legs, groin, buttocks and finally your stomach. When you shower or bathe, the dead skin cells will be easy to remove and wash away. This section is designed specifically to help parents turn soap making into a fun learning experience for their kids. 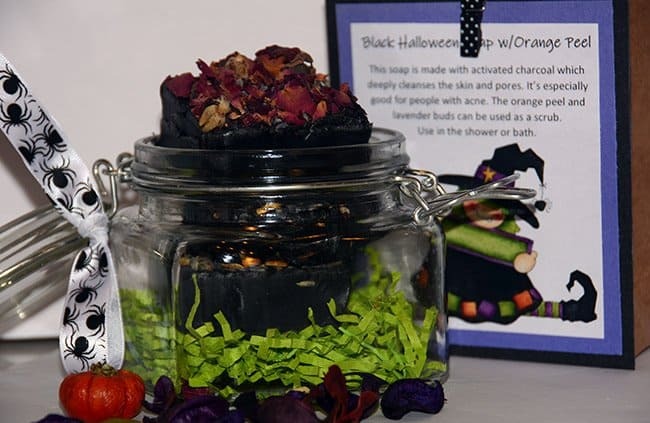 Activated charcoal is used in the Halloween soap. It turns the soap into a delicious intense black (perfect for the holiday). And–there are many amazing things that activated charcoal does for your skin. It’s particularly great for teens with acne. Enjoy making these soaps with your kids and please share your results and experiences. Do you have a favorite soap recipe that you would be willing to share? Please share in the comment section below. Want to remember this? 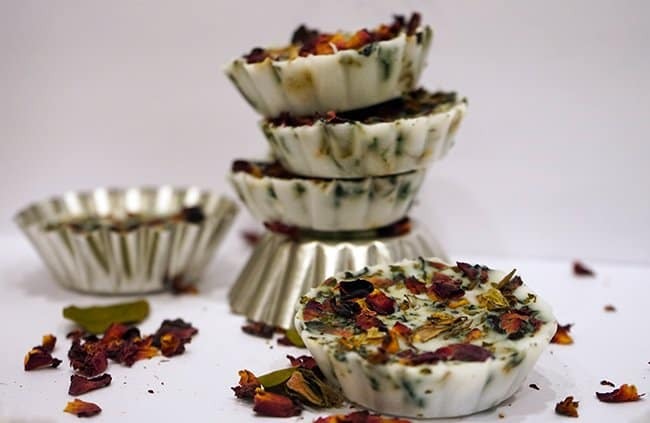 Post these Holiday DIY Soap Making recipes to your favorite Pinterest board. « How to Make the Best Holiday DIY Sugar Scrubs with Your Kids! Good morning Sharlene, I wanted to make these fun soaps with my kids. I was wondering if you know of a soap base that doesn’t contain SLS. Thank you so much for all your great advice and wisdom in helping to navigate parenthood. No, it doesn’t have SLS. If you want to make it easier–just get the white soap base–then you don’t have to use titanium dioxide. I like to use titanium dioxide with kids because when you put it into the clear soap base it dramatically changes to the solid white soap. It’s just an added learning experience for kids. And then you can use goat’s milk. How fun is this, Sharlene! I must admit, I too have been intimidated to make soap because I thought the process was so hard. I always walk past the soap aisle in the craft store and wish I knew how to do it. Thanks to you, now I do! I’m really interested in trying the Halloween soap because of the benefits you listed for using charcoal. I have a teen that could really use it at the moment 🙂 Thank you! I know, I was afraid to try making soap, too. I didn’t like the idea of using lye. These are super easy recipes. 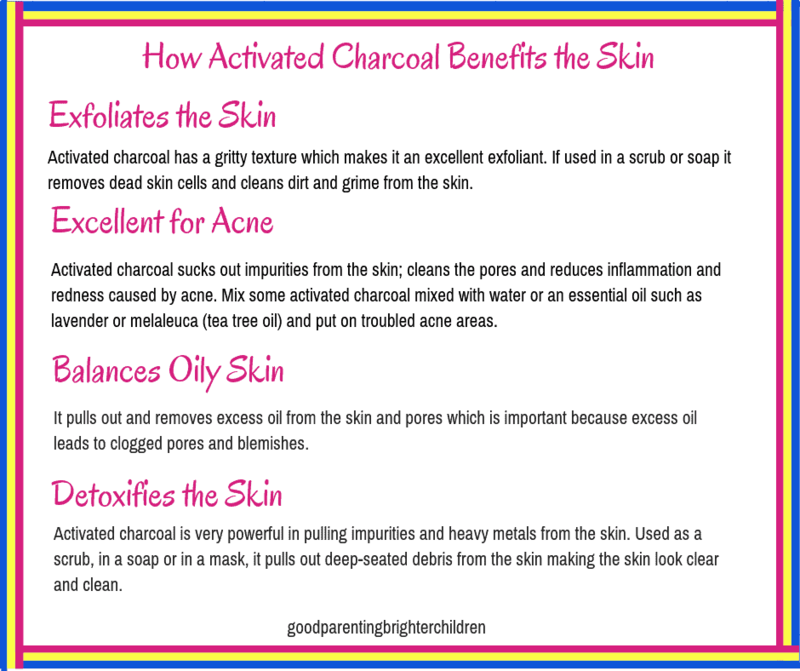 And, charcoal is amazing for acne. It literally pulls bacteria and debris out of the pores. You can also just use activated charcoal as a mask by getting the powder form and make it into a paste using milk (milk has lactic acid which is helpful to use as an exfoliate) and then put it on troubled areas of the skin for 10-15 minutes. Thanks for commenting! Appreciate the support!